Farley & Thompson celebrated its 80th year in business with a Charitable Reception for clients and professional connections at Canford School. Guests were invited to the stunning Great Hall to experience live entertainment from flautist Annabelle Carter, violinist Charlotte Gallagher and pianist Ian Evans. The evening’s programme of chamber music included an arrangement of Edward Elgar’s Salut d’Amour, Claude Debussy’s Claire de Lune and Vittorio Monti’s Czardas. After the concert, refreshments were enjoyed in Lady Wimborne’s Long Gallery. Through the generosity of our clients, more than £3,000 was raised for the Bournemouth Churches Housing Association. This is a charity that provides a diverse range of social support and training as well housing for those who need it. Based in Bournemouth it operates across the south from Plymouth to Reading. We were delighted in September in celebrating Farley & Thompson’s 75th year as a Bournemouth stockbroker to welcome once again many clients to our annual event. This year we returned to the Medici Suite at the Italian Villa, Compton Acres in Poole where 150 guests enjoyed a classical concert featuring a sextet from the Bournemouth Sinfonietta Choir, flautist Annabelle Saunders and violinist Oliver Nelson accompanied by pianist Roy Stratford. This year our chosen charity is The Oaks Counselling Service who provide professional, face to face counselling for individuals and couples who might be experiencing any challenge of a personal nature. The service provides a fresh perspective on peoples’ lives and circumstances. Collectively, our clients, not all of whom could join us on the evening, supported the 2013 appeal with a most generous £4000 in donations for the charity. 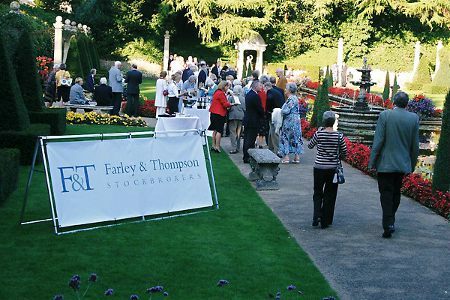 Celebrating 77 years as a Bournemouth stockbroker, clients and guests of Farley & Thompson enjoyed an early evening concert in the stunning location of The Italian Villa at Compton Acres. We were entertained by flautist Annabelle Saunders and violinist Oliver Nelson accompanied by pianist Roy Stratford. The evening’s programme of chamber music included Francois Borne’s arrangement of Fantaisie Brilliante (on themes from Bizet’s opera Carmen), Tchaikovsky’s Lullaby from Mazeppa and Chopin’s Barcarolle. 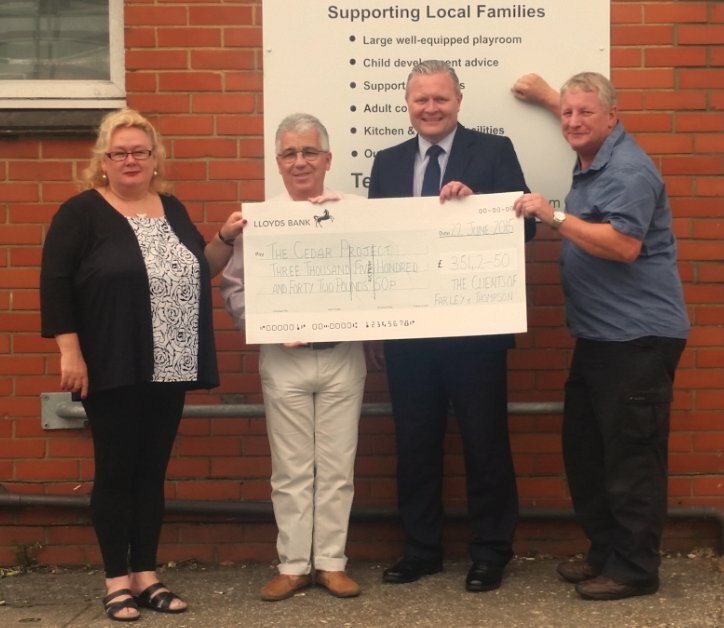 Through the generosity of our clients £3,542.50 was raised for local Southbourne charity, the Cedar Project, which helps children affected by domestic abuse. Farley & Thompson Partner, Martin Poole, is pictured handing over the cheque to charity patron, Councillor Christopher Wakefield, Centre Manager Debbie Young and Cedar Project Children’s Worker, Peter Webber. Now in its 65th year, the Christchurch Arts Guild exhibition was once again supported by Farley & Thompson together with arts products supplier Artcetera. 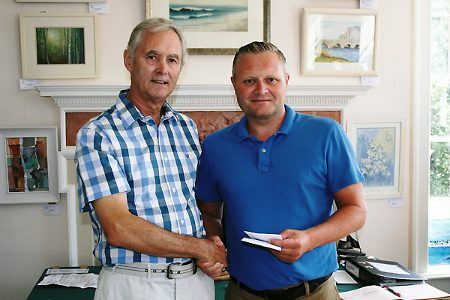 Farley & Thompson partner Martin Poole was delighted to officially open the exhibition on the morning of Saturday August 3rd and to present prizes to worthy winners in a number of categories. This is the final year in which the exhibition will be held at Priory House Christchurch as the Guild seeks a new venue for its summer exhibition for 2014 and beyond.